A futuristic kitchen designed by Virginia Tech University researchers includes a dishwasher that sends a text or email when it is out of soap, a microwave that listens for the moment when popcorn stops popping and a pantry that can report low supplies. But it will be a while before most big U.S. home builders offer such automation on a mass scale. Home automation has made great strides in recent years, with wireless technologies enabling users to monitor and control more functions remotely. Yet many builders are including only the most basic elements of automation as standard features in the houses they build, leery that fast-changing technologies can’t yet seamlessly automate all of a given home’s devices and systems at a mass-market price. Many builders acknowledge that buyers expect new homes to include modern features, and that full-home automation eventually will be included in that expectation. A survey last year of 4,556 U.S. Internet users by technology research firm Forrester Research Inc. found that 18% were using at least one automation feature in their homes. We are here to serve your Residential and Commercial Theater Design Needs. “By 2020, half of households, particularly affluent ones, will be engaged in some kind of substantial aspect of home automation,” said Frank Gillett, a vice president and principal analyst studying home automation for Forrester. Some homeowners, like Raffi Kajberouni in Santa Clarita, Calif., already are there. Mr. Kajberouni bought a new three-bedroom home from KB Home in 2012, ordering all automation options available at an extra cost of $18,206. The system automated his home’s security, thermostat and solar power system, allowing him to control each with his mobile phone. Last summer, when at the airport to depart for a two-week trip abroad, Mr. Kajberouni used his mobile phone to shut off his home’s air conditioning. Since buying his home, Mr. Kajberouni has spent $4,000 on still more technology, including a Samsung Electronics Co. automation-enabled refrigerator and a connected digital video recorder. “If you have someone who knows technology, like me, they’re going to embrace this,” said Mr. Kajberouni, a 33-year-old chief financial officer for an aviation-repair company. For now, though, the interim route for many builders is to offer partial automation. The upfront cost for the systems’ hardware typically ranges from the hundreds of dollars into the thousands, which builders include in the price of the home. Thereafter, homeowners using security or energy-monitoring services tied to their automation systems often pay a small monthly fee. Beyond that, it is up to the home buyer to add any bells and whistles and to ensure they are compatible with the system already in place. Builders Lennar Corp. and Meritage Homes Corp. have taken a partial approach by installing in their homes Ingersoll-Rand Co.’s Nexia Home Intelligence System, which allows users to connect and control their security systems, heating and air conditioning systems and garage door, among other things. But Nexia doesn’t yet interact with kitchen appliances or most entertainment equipment. KB Home in 2013 chose Schneider Electric SA’s Wiser Home Management System for all of its homes. The system can monitor and control a home’s energy use and connect to the home’s security, heating and air conditioning and lights, as well as smart appliances from Whirlpool Corp. Some builders are hesitant due to past experiences. A decade ago, David Weekley Homes experimented by outfitting some of its homes with entertainment-automation systems offered by small, third-party providers. But the resulting glitches, customer-service fallout and reputation damage left Weekley reluctant to dive back in. Weekley now offers, but doesn’t promote, automation features as options in its higher-end homes. The race to automate part, or all, of the American home was on display last month at the combined International Builders Show and Kitchen & Bath Industry Show in Las Vegas. Among the highlighted home features controlled by mobile devices were luxury coffee makers, garage doors and digital door locks. AT&T Inc. showcased its Digital Life automation system, introduced in 2013, for connecting and operating a home’s thermostat, lighting control and security system, with video cameras, automated door locks and other features. 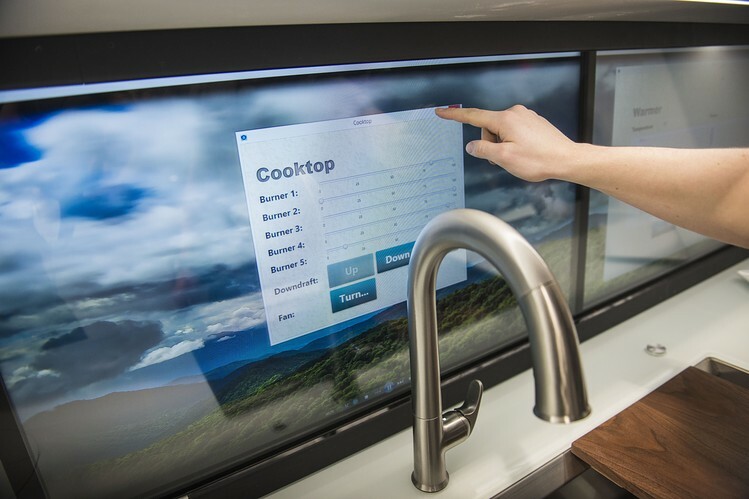 The prototype kitchen by the Virginia Polytechnic Institute and State University, commonly known as Virginia Tech, includes numerous networked appliances and fixtures. Each can be controlled by voice commands or gestures, the homeowner’s smartphone or through touch screens such as the 55-inch screen embedded in the kitchen’s island countertop. Whether consumers will use such applications, and whether builders will need to incorporate them in the future, remains a focus of experimentation and research. “It’s more or less filtering of what is useful and what isn’t,” said Joseph Wheeler, coordinator of Virginia Tech’s Center for Design Research. NextLet Us Design Your Custom Home Theater System!